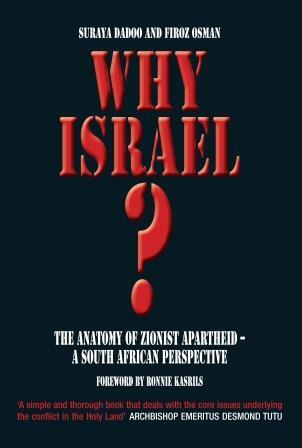 Suraya Dadoo and Firoz Osman launched their book, Why Israel? The Anatomy of Zionist Apartheid – A South African Perspective at the Polokwane Library auditorium on Tuesday evening. Why Israel talks about issues and situations that are caused by the conflict between Israel and Palestine in the Holy Land. It was published by Porcupine Press, an independent Johannesburg-based publisher. Dadoo said: “Why Israel? is fully-footnoted, with a full-colour photo essay, powerful quotes in side-bars, a detailed bibliography, index, and a list of useful web sites and resources. It will be useful to high school learners and university students, academics, journalists, government officials, researchers and Palestinian solidarity activists. In fact, the book will be an indispensable guide for anyone wanting to fully understand the harsh contemporary realities of the Israeli-Palestinian conflict”. The launch of the book was also used to celebrate the anniversary of Israel Apartheid Week, which will be held March 10 to 16 and is celebrated worldwide. Dadoo is a researcher for Media Review Network, a Johannesburg-based advocacy group. She holds a masters degree in Sociology from Rhodes University. Her writing in the book focuses on the impact of the Zionist occupation on Palestinian media, education, healthcare, and family life. Osman is a medical doctor by profession and a highly-respected South African commentator on the Zionist occupation of Palestine. An executive member of Media Review Network, Osman has a special interest in Palestinian political and resistance movements, Zionist oppression, and Islamophobia. Why Israel? is available in all bookstores in South Africa and E-book and Kindle versions are also available.